My mom's boyfriend makes this fabulous chocolate cake. He hasn't made it gluten free yet, so I did to prove it's possible. This is a good cake. It's not too sweet, quick to whip up, and serves a crowd. You should use some good quality cocoa, but if all you have is something crappy that's fine too. I used Hershey's. It was fine, but could have been better. Preheat the oven to 350. Lightly grease a 9x13 pan (I use glass). Mix together the dry ingredients, and then in another bowl mix together the wet ingredients. 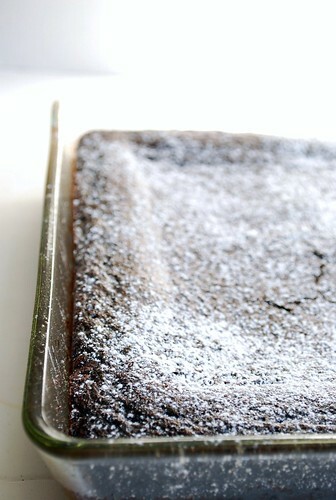 Fold together, pour into the pan, and bake 45-50 minutes until the cake starts to pull away from the sides a little and a toothpick stuck in the middle comes out clean. Combine ingredients, and beat to stiff peaks. 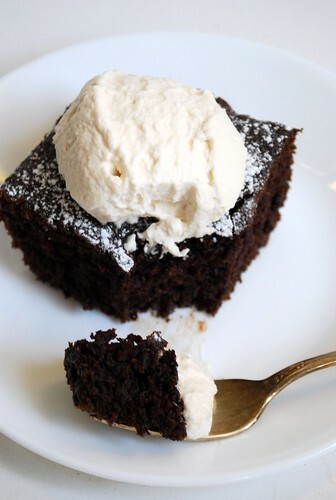 Serve on top of chocolate cake. 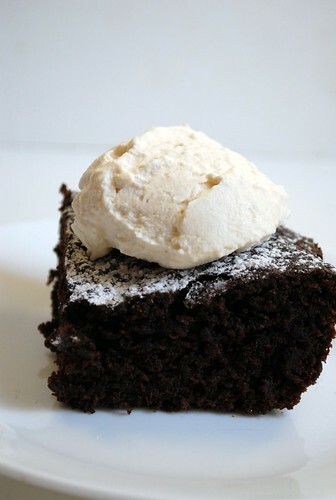 Kahlua whipped cream...what a delicious way to take ordinary chocolate cake to the extreme! this sounds awesome. I made this without the whipped cream and it is awesome. Got my 14-year-old's stamp of approval, that's for sure. Thanks for a great recipe! I made two 8" cakes and froze one. Now that I see how good it is, I'm kind of sorry I didn't make the one big cake. It's going to go fast. What would you suggest to use instead of coffee? I'm not a coffee person at all! I really couldn't taste the coffee, Bryn. I only tasted CHOCOLATE. To the nth degree. wow this looks so dark and chocolatey! This looks great! 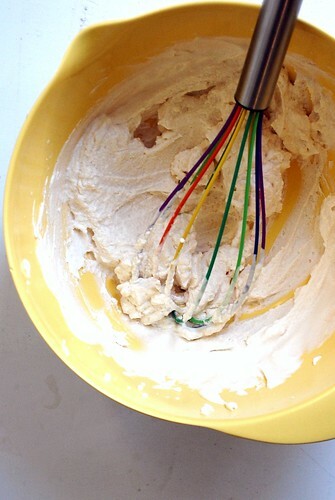 Love the rainbow whisk! This looks wonderful and so easy to veganize you won't even have to think about it. Since I just have a household of two I'm gonna have to halve it or eat it every half hour until it's gone! Thanks for the wonderful recipe. Maybe I should have cupcakes instead? So many treats, so little time. I'm in LOVE with your whisk!!!! I've never seen a multicolored one like that before!! So cute!! :-) and the cake looks pretty darn delicious too! I could eat that, oh yessss I could! 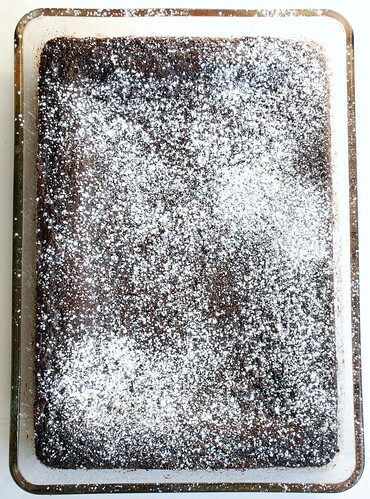 I love a good ol' simple chocolate cake without all the fuss but packed with decadent flavour! Thanks for sharing. What is the original recipe for this? I'm not a gluten-free person and I am finding it quite difficult to find xanthan gum. I don't need it to be gluten free... would you recommend cake flour or all purpose? & would it still be the same measurement? Ok so I made the recipe... but I added a cup of ground coffee... I'm pretty sure this was totally wrong! I realized you probably meant... cup of brewed coffee, am I right?